What do you get when you add 3 days in Colorado + 2 old roommates +1 mission = fun! A few weeks ago, my old San Diego roommate came to visit me in Denver from her home state of Florida. It has been almost 7 years since we lived together at the SoCal beach, and it was the first time that we hung out since I have become a mom. Having a 22 month old in tow with us most of the time for her visit was worlds away from our sunset happy hour bike rides on the Pacific Beach boardwalk; and I was pleasantly surprised that I felt the same way when I was with her, and she acted the same around me. That is the test of a true friend… and the testament to the flexibility of an adventurous child. Miss Cat, as my daughter calls her, and I met through a sorority alumni happy hour at Nicks at the Beach. Over a pitcher of Sierra Nevada Pale Ale and a papas quesadilla (a delicious carbo-load quesadilla made from mashed potatoes, cheese, scallions and bacon) we hit it off immediately and ended up living together for almost a year, creating many memories as single ladies that are reserved only for the recesses of our minds. When our domestic partnership dissolved, she returned to her home state of Florida to leverage her Occupational Therapy degree along the southeastern coast of Florida (including a year or so in Key West), and I got engaged and moved back to Denver where my husband and I went to college. Although our communication was sporadic, she did manage to visit us a few years ago for a ski trip to Breckenridge…and decided this winter that it was time for another Colorado rendezvous! So what do you do with a warm-blooded gal who comes out to Colorado in the winter?! With my season pass at Loveland Ski Resort, I was able to get Miss Cat a discount on gear, lessons and a lift ticket. Although she had come out to visit ME, she had only snowboarded three times in her life, so I did not want to spend the day coaching her and us both getting frustrated. Plus, it was a powder day and I was itching to go play by myself and hit the fresh snow! But like all good hosts and apres skiers, I saved us a table in the lodge and we met for beers and nachos when the day was over. Loveland Ski Resort and a Fat Tire Beer – this Southern gal fits right in here in the Rockies! This was probably one of the best snowboarding days that I have ever had. Picture this: the snow was falling, but it was not a white-out; there was little wind except at the top of chair 2 where the lift is exposed; and the temp was mid 30’s! This is especially awesome because I did not want my Floridian friend to be uncomfortable in the elements – plus she only wore one base layer under her ski jacket for warmth…oops, I should have checked her foul-weather gear before we left the house that morning! By the way, my daughter was with us on this trip. We kept talking about our girls adventure in the mountains on the car ride up, so the tears signaled that she was a little miffed when I whisked her off to the daycare as soon as we pulled into the parking lot. This must have been confusing to a toddler. But she was happy to run around in the lodge for apres ski with us, and then get pulled on her sled through the parking lot back to the car. Boulder is a great day trip, or even half day trip from Denver because it is only about 30 miles / 45 minutes depending on what part of the city you live, and what time of day you are traveling. Boulder is Denver’s sister city and many live and commute each way. After a leisurely morning, we three girls jumped into the car for our scenic drive – we viewed the Flatirons as we approached Boulder and Little P was even able to get about an hour nap in. Since we were hungry and salivating over the anticipated craft beer we would be sampling, we decided to go directly to Boulder Beer Company when we pulled into town.We chose this particular brewery because it has a restaurant (a must when touring breweries with a child), and I had never been there before, but loved some of their beers. Miss Cat “Hazed and Infused” after a few beers! Plus, I scoped out their website and saw that they had an 11% ABV, seasonal Honey Saison that is only available at the brewery, and that is my favorite style of beer right now! Table for two and a half, please! My daughter ate a kids salad, and Miss Cat and I split two huge Bavarian pretzels with jalapeno mustard and spicy ranch sauce – this is my favorite culinary accompaniment to a craft beer, and the salty mixed very well with my sweet beverage. We each had the Honey Saison. Good service and low key crowd; and the place got packed during the two hours that we were there. Fortunately for my active/squirmy daughter, and my warm blooded guest, it was about 60 degrees outside; so we went to the outdoor patio and visited with other beer lovers, dogs, and brown remnants of piled up snow. At 2pm we took the brewery tour. I threw my daughter into an Ergo backpack and she did great, listening to the guy speak and sampling some of the barley that was passed around. I love the fact that our tour guide sipped on a beer the entire time! But being only two years old and not as interested in the process of making beer as I was, I had to hang back and distract her with copper kettles and bottling machines. So, I don’t have that much info on the beer making process to share, but I can say that it was pretty cool to be able to duck under and around and through all of the equipment during the “all access” tour! At some larger, more corporate breweries, you are herded like cattle and see everything from behind glass. At the end of the tour, the group was taken to a little room and given pitchers of all the beer to share in our little sample glasses. look at all those yummy choices! Next stop was Pearl Street, a pedestrian friendly street that spans several blocks. It is stocked with restaurants and boutiques, playgrounds and freaks. There are lots of actual street performers and then scraggly, but harmless, homeless to entertain you as you wander and window-shop. 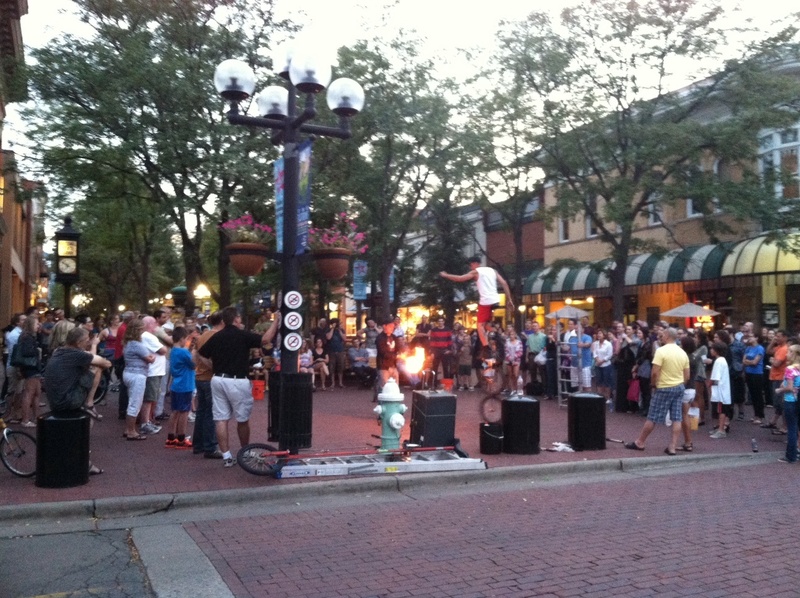 just a typical day on Pearl Street with flames and unicycles and all! It was a good opportunity to show Miss Cat the local flavor, while my daughter climbed on the rocks in the mini-park and got her wiggles out. 3. Denver Restaurant Week – ladies night out. Just like we used to “kick it” as roommates in San Diego, Miss Cat and I got all gussied up one night and went into downtown Denver to enjoy an adult meal. I even broke out my white leather wrap coat with the fur collar! But not before I gave Miss Cat a proper sampling of Colorado Craft Beers. I chose the Polished Tavern because I absolutely love Polish / Austrian/German food – it’s in my blood! Over two hours, we savored potato/cheese perogies, feta/spinach perogies, wienerschnitzel, mango infused vodka, and vodka martinis. The ambiance was chic too, with most of the tables, and all three traditional bars, containing a troth of ice running down the center, lit up with neon colored light. Polished Tavern was on the corner of the street with windows on all sides so it was also fun to people watch, and take in the vibrancy of the city life as we ate. An ice troth at each high-top! Miss Cat’s whirlwind three day visit left me exhausted and a bit out of my routine (if you can call my lifestyle routine). We ate, drank, were merry…drank some more…let’s just say that my liver and stomach needed a break. But it is always a pleasure for me to play tour guide within our amazing state, and show a friend a good time, specific to her tastes. looking good – and with a lot more clothes on than when we lived at the beach! My adventures with Miss Cat reminded me that I am not always “just a mom”, but a fun-loving gal too. And even though our carefree days as roommates at the beach are behind us, we certainly created some great new memories together in the Mile High City!